. 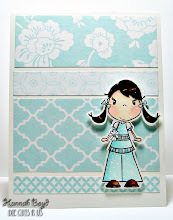 : Customer Blog Hop at C&Co. Customer Blog Hop at C&Co. Hello and Welcome to Claudia and Company's first ever Customer Blog Hop! We’re so excited to have you join us! Today Claudia and Company is celebrating all of US; their dear friends and customers and that includes YOU! start the hop and get all the deets! Be sure and leave a comment on each of today’s fabulous posts, to be eligible for the prizes that are up for grabs! You'll have until Monday, February 28, 12pm EST to comment. Winners will be announced on March 1, during their Release Day Showcase. Here is the complete list of stops on the Hop! Thanks for joining us and happy hopping! SO SWEET, Hannah!!! Love your coloring- as always - lol! 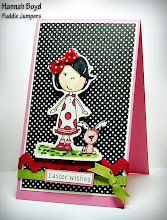 Such a fun card... so cute! So very cute - and just my style too! Hannah, I can't help but smiling when I pop over to your blog and see your cutie pie pic staring back at me! And then I continue to smile and be inspired when I see your creations! Landon Lolli is sooooo cute and I adore those little splashes of color. SUPER CUTE CARD!! Hannah, you are one VERY talented young woman!! Your cards, coloring and blog are a joy! Thanks for sharing your talent! A really cool card Hannah - love it! Positively delish! Such a cute, sweet card! What a wonderful showcase of this super duper Landon :) Beautiful crafting! So much talent you have - I know your mommy is uber proud :) Blessings! So cute Hannah! It's perfectly clean and simple. I really like the idea of using a white border underneath the image, that is fantastic. Really nice job! Hannah girl, this is just too cute!!! Love how you colored Landon. I just added myself to your followers list. I don't want to miss a thing. You are an amazing young lady!! Hannah, your designs are always so cute and so well done. Great job! Awesome! The button looks like a basketball. Awwww I love this card!!! It's so clean but gorgeous at the same time!!! Love the colors!!! Great job!!!! 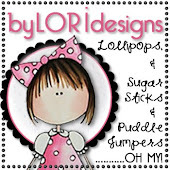 Oh, you sweet card really shows off the Landon Lollipop that you've colored just beautifully! Love how you matched the green button to his socks and the stripes on his shirt! CUTE! What a perfect CAS card. Definitely a fabulous boy card. I love your blog and coloring your digis. I am giving you the Stylish Blog Award!! Come visit my blog and see what you have to do. Hannah Bug, I like the simplicity of your card. It really lets your Landon image shine. Hi Hannah!! Your card is ADORABLE!! Hannah, your Clean and Simple card is so terrific! You've definitely inherited your mom's talent. wow...great one... I love this cute card. This color is looking beautiful and soft. the little boy is so cute. Thanks for this great card.